Penguin Salvage-2 info about the game-Games2Rule. 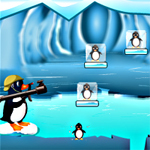 Assist the commando-penguin to rescue the other penguins from the frozen state by shooting the fire balls. Unlock the higher levels by using three fire balls in every level to salvage penguins.